Kellton Tech is awarded in the category "Digital Innovations in Service Provider Industry"
Krishna Chintam, Managing Director, Kellton Tech with the award "Digital Innovations in Service Provider Industry"
Kellton Tech, a global IT company, was awarded in the category ‘Digital Innovations in Service Provider Industry’, at the 3rd edition of The Digitizing India Awards, a Cisco initiative in collaboration with CNBC-TV18. 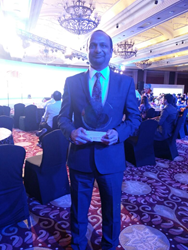 In the ceremony held in New Delhi today, Kellton Tech received this award in recognition of its significant strides towards transforming digital experiences for organizations. Kellton Tech, a pioneering enabler of digital transformation with strong grip on enterprise solutions, has been in the news radar for its rapid growth, successful deployments, acquisitions, and revolutionary use of its IoT innovation, KLGAME. KLGAMETM engages the elements of ISMAC (Internet of Things, Social, Mobile, Analytics, Cloud) in a synergistic manner to provide holistic communication experience, and has already been implemented in various conferences besides having fielded some pilot projects across the globe. Kellton Tech was also the implementation partner for mSehat, a SIFPSA initiative empowering frontline health workers to improve maternal and newborn health outcomes in five districts of Uttar Pradesh through ICT-enabled solution. Kellton Tech developed this cloud-hosted, mobile platform, which was touted to be the largest enterprise mobile application rollout in health and e-governance sector in India. mSehat was launched by Uttar Pradesh Chief Minister Shri Akhilesh Yadav last year. Kellton Tech Solutions Limited is a public listed (BSE & NSE: KELLTONTEC), CMMi Level 3 and ISO 9001:2008 certified global IT services organization. It is headquartered in Hyderabad, India and has development centers in the United States, Europe and India. For two innovative decades, Kellton Tech has put into practice the vision upon which it was founded viz. "to offer infinite possibilities with technology". The company is committed to providing end-to-end IT solutions, strategic technology consulting, and offshore product development services. Kellton Tech serves the full gamut of customers including startups, SMBs, enterprises, and Fortune 500 businesses. The organization has serviced customers representing a wide range of verticals including retail, travel, e-commerce, education, hospitality, advertising, market research, manufacturing, consumer goods, logistics, SCM, and non-profits. Kellton Tech is also a global leader in providing Enterprise Mobility Solutions, Mobile Application Development, Enterprise Solutions & Internet of Things.